Even in the most foreboding situations, prayers can be heard and help can be found. 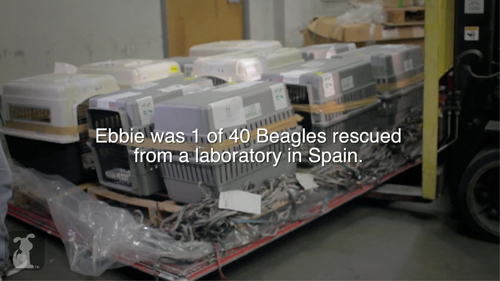 40 beagles born into a life of lab testing in Spain found themselves homeless and in jeopardy of being euthanized. 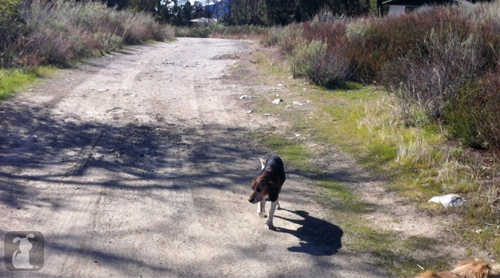 There were two options: find a rescue that could help these animals, or face euthanasia. 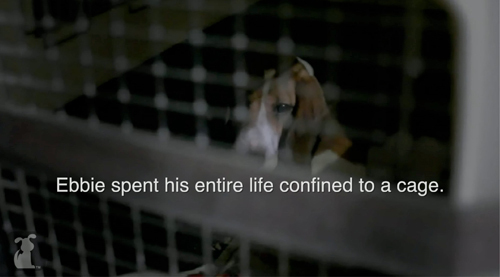 A plea for the beagles was sent out to rescues around the world. There wasn’t a lot of time for someone to step up, so actions had to be taken swiftly. The Beagle Freedom Project, a rescue organization located in the U.S.A. stepped forward and assumed the hefty $100,000 responsibility of shipping the Spanish 40 to America safely. It is hard to believe that animals are still being used for testing within the United States and worldwide. Beagles especially, are the go-to breed for testing facilities. They are used for a multitude of products such as medical/pharmaceutical products, cosmetics and household products. Why are they the favorite breed for Lab work? 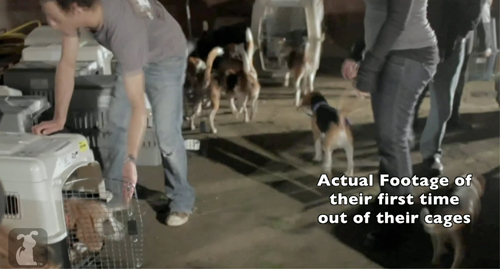 Because beagles are docile, friendly, and adapt well to living in cages. Lab beagles, known for their loud bark, are often silenced through a surgical procedure called vocal cordectomy, which is basically removing vocal tissue to reduce the volume of their barks. 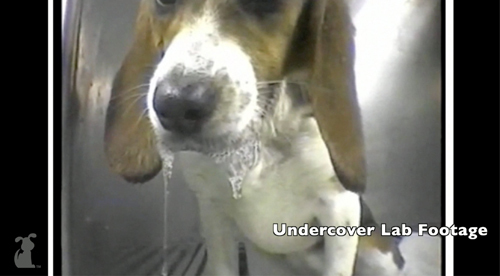 In the United States alone, some 70,000 beagles are still being used for animal testing. Inside the Lab, the beagles are poked and prodded. Sometimes their only human interaction is being tested on. Once the labs are done testing on a particular animal, it is euthanized. That’s what would have happened to the Spanish 40 had the good people of The Beagle Freedom Project not stepped forward to claim responsibility for the animals. 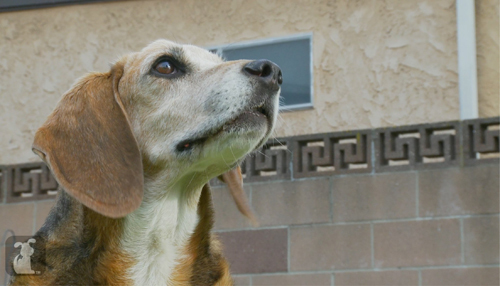 When the Spanish 40 touched down in Los Angeles, CA, The Beagle Freedom Project got to work rehabilitating and rehoming the dogs. It was clear; the best place for the dogs was in a loving foster home. The dogs had many firsts that day. It was the first time they touched grass and the first time they felt freedom. They had never been in a home before, or walked on a leash, and toys were unheard of. Some of the dogs fared better than others. Ebbie, a quiet boy, was one of the less fortunate ones. Ebbie, short for Ebenezer, had suffered inside the Lab for five years. He had tumors all over his body. He could not eat or drink. He had given up and was wasting away. Trips to the vet did not produce answers. 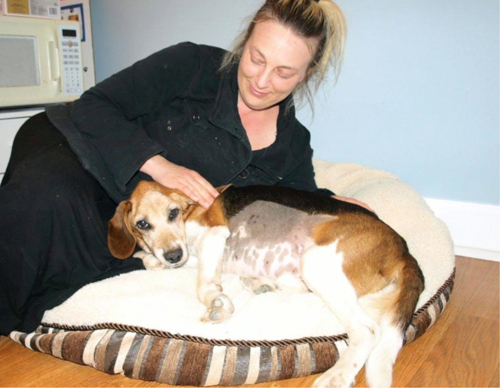 There were no medical explanations for the problems these beagles suffered. Doctors could only guess that these problems and conditions were possibly caused by residual toxins still in the body, from the years of lab testing. For Cindy, Ebbie’s foster mom, it seemed as though he had lost his will to live. He couldn’t even stand. Each shallow breath, potentially his last. 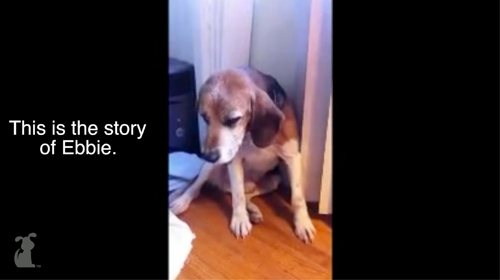 Shannon Keith, founder of Beagle Freedom Project, wouldn’t give up Ebbie. She hand-fed small bites of soft food to him, tended to him day and night, and bit-by-bit, minute-by-minute his condition steadily improved. It wasn’t until Shannon brought home a litter of motherless pit bull puppies, that Ebbie made a turn for the better. 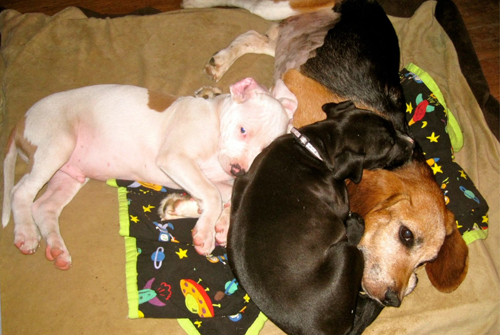 In an instant, the puppies gravitated to Ebbie, who could barely walk. Somehow the puppies and Ebbie drew strength from each other. They would sleep and snuggle together. For the first time in Ebbie’s life, he had the love and affection he missed his whole life. Within weeks, Ebbie was standing, then walking. Months later, he was running. One year after his rescue, Ebbie is in his foster turned forever home with his mom Cindy. Each day he is learning something new, and is finally learning how to behave like a dog. He doesn’t seem to have any residual emotional problems. His leg still isn’t strong enough for him to jump up on the furniture, and that will probably never happen. He’s a mellow guy who loves all people and is hungry for the affection of the humans around him. Ebbie even has a new girlfriend named Buttercup. She’s 14 years old, deaf, arthritic and going blind, but beauty is in the eye of the beholder, and all Ebbie sees is love. 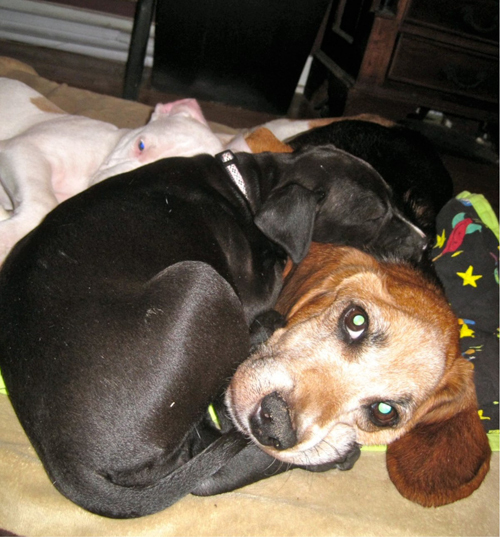 Ebbie follows Buttercup’s lead, and the two cuddle up together for hours at a time. Ebbie doesn’t let his past define him. He loves everyone. Ebbie has forgotten his past, and just wants to be loved, and touched, and cuddled. To follow the progress of these dogs and more follow The Beagle Freedom Project on Facebook and if you feel moved to help, you can make donations via their website.